- the desktop is piled [apparently] chaotically with a bunch of files and folders for projects I am working now or worked lately. Believe me, I can find what I need there. Am I boring or what? No, you are doing something useful with your computer instead of playing with it uselessly. Good job! Nicu, metacity can do true transparency. Can be set in gconf://apps/metacity/general/compositing_manager key. @Martin: now when you say so I remember I knew about it but I also remember it was something wrong with it... don't know, maybe some performance issues? @nicu: Not sure. I'm using since about F10 or F11 and it works like a charm and with no performance issues. At one point there was an issue with ibus but that's fixed now. 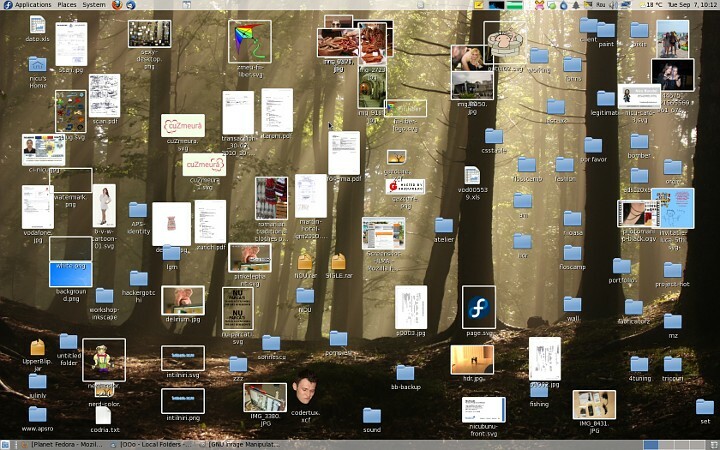 Finally someone that organizes his desktop in a way that even I can understand. Same size icons and auto-align ain't for people with brains. I am also a strong believer in the "organized chaos" style of desktop management. The most usefull stuff will always be available and visible to the user of such a desktop (mine tends to become almost this cluttery in a few mounts after I cleanup/reinstall OS, but I can always find what I need in less than 5 seconds).